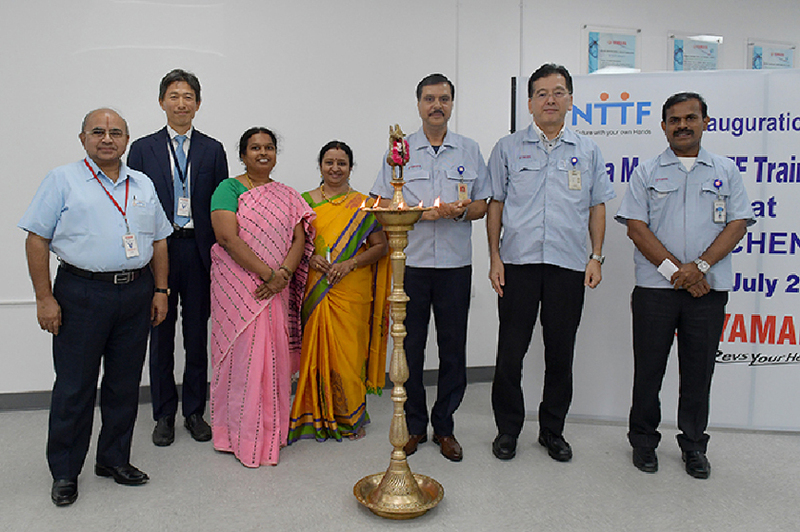 Yamaha Motor Opens First Japan-India Institute for Manufacturing in Chennai — Public-Private HR Development Program through Japanese/Indian Government & Japanese Corporate Collaboration — - News Releases | Yamaha Motor Co., Ltd.
IWATA, July 21, 2017—Yamaha Motor Co., Ltd. (Tokyo:7272) announced that it has today held the opening ceremony for the YAMAHA MOTOR NTTF Training Center (YNTC), newly established at the Chennai Plant (in Tamil Nadu State) of its local subsidiary India Yamaha Motor Pvt. Ltd. (IYM). The YNTC is the first center opened as part of the Japan-India Institute for Manufacturing (JIM) initiative, which is being undertaken by the Government of Japan, the Government of the Republic of India, and Japanese companies as a key part of the public-private sector Manufacturing Skill Transfer Promotion Program. Aiming to establish Japanese-style manufacturing shop floor working methods and skills in India, this program involves collaboration between the Government of Japan and Japanese companies to realize the “Make in India” and “Skill India” initiatives advanced by Indian Prime Minister Modi. Through the establishment of Japanese Endowed Courses (JEC) at existing engineering colleges, the Government of Japan and the Government of the Republic of India aim to train 30,000 Japanese standard shop floor leaders and engineers over the next ten years. Moreover, in advance of the opening ceremony, a JIM Accreditation Ceremony was held on June 27 at the Ministry of Economy, Trade and Industry, the Government of Japan. At the ceremony, four Japanese companies - including Yamaha Motor –were certified as members of the JIM, and are advancing preparations for the opening of JIMs. From its opening on July 21, 40 students aged 18 to 21 have been admitted for the first academic year at the YNTC, the maximum per year. Over the course of the four-year program, students will learn practical skills in Japanese-style manufacturing, covering nine main areas: motorcycle assembly, parts control, paint, welding, casting, machining (in both aluminum and steel), quality control, and utility techniques.